OMEGA’s PXM80 Series is a heavy duty, wet/wet, differential pressure transducer available in ranges from 0-2 to 0-350 bar. The Series is available with either of three outputs; mV/V, amplified 0-5 Vdc or 4-20 mA. These are suitable for interface with most PLCs and computer based control systems. An extremely high over pressure capacity of 100 bar or 150% of capacity (whichever is greater) make the PXM80 an extremely durable transducer. 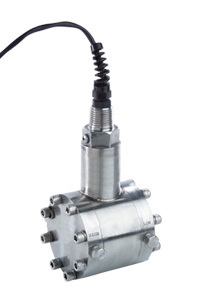 The all stainless steel construction, and high over pressure protection make the PXM80 Series differential pressure transducers a high reliability transducer in harsh industrial environments. The PXM80 is also available in standard/Imperial configurations, with NPT ports, and models from 0-30 to 0-5,000 psi pressure ranges. Please see the PX80 for complete details, or contact our Pressure department for more information.